The Committee on National Statistics first issued Principles and Practices for a Federal Statistical Agency in 1992. Beginning in early 2001, with the second edition, it committed to updating “P&P” every four years to coincide with a new presidential administration or second term. This slim document underscores for the executive and legislative branches of government the important public good provided by strong federal statistical agencies. The sixth edition of P&P, released in 2017, presents and comments on the document's core principles as they’ve been impacted by changes in laws, regulations, and other aspects of the environment of federal statistical agencies over the past four years. The Sixth Edition of P&P is available online. Download a copy of the Report Highlights. The scientific integrity statement, which was adopted by 13 statistical agencies in response to an Office of Science and Technology Policy (OSTP) directive, references P&P along with OMB statistical policy standards as the bedrock for the statistical agencies’ scientific integrity. The agencies designated as "principle statistical agencies" who have adopted this statement are listed at the beginning. Adapted by Tom Gallagher, Manager, Research & Planning, Wyoming Department of Employment. 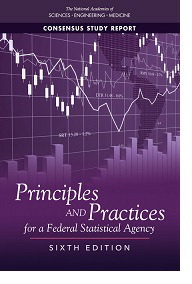 "Report Offers Best Principles and Practices for Federal Statistical Agencies"
The fifth edition of a report from the National Research Council describes four fundamental principles and recommends 13 practices that would best position a federal statistical agency to provide accurate and credible statistical information to policymakers and the public. Principles and Practices for a Federal Statistical Agency is revised every four years so that it is current at the beginning of each presidential administration and reflects changes in laws and regulations.